We went back to artificial this year. I love the idea of a real tree. For the last six years, we've gone to get a real tree from Kathy's Tree Lot on the day after Thanksgiving. $80 a pop. And it's beautiful and it smells lovely. But the sad fact was, real trees just don't have strong enough branches to hold all of our ornaments, so each year many got left in the boxes that just wouldn't fit. The ones that were on the tree would weigh the branches down and take turns falling off. As would the needles. The constant vacuuming, the back-of-my-mind worry about the tree drying out and catching fire, the one more chore of watering. . . I just decided to bite the bullet and go back to fake. I figure in three years it will have paid for itself. 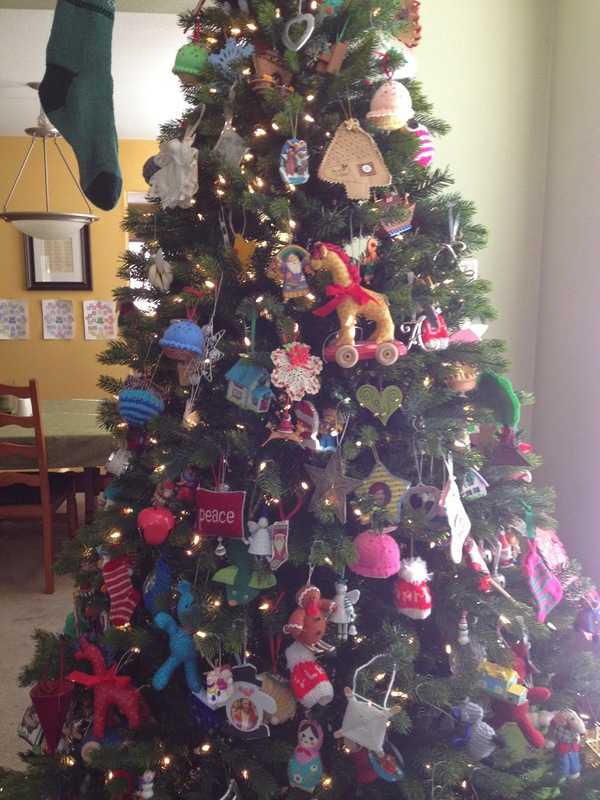 And I can enjoy all of my beloved ornaments! 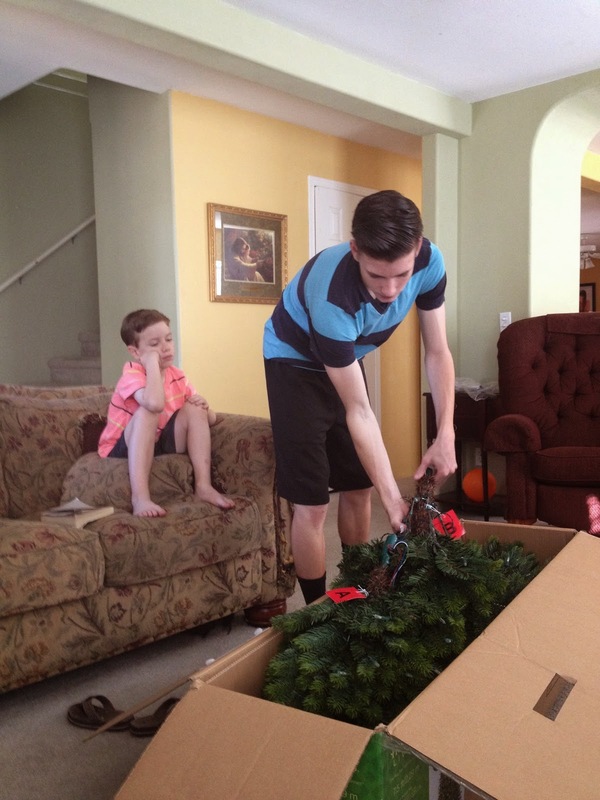 Thank goodness that Aiden is here to haul the tree inside and assemble it! And thank goodness it's pre lit! 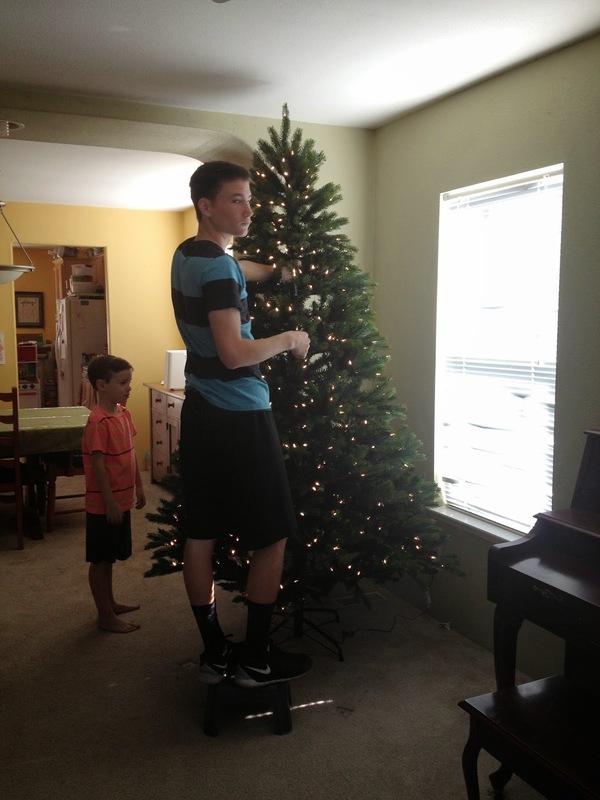 No more messing with strings of lights! So, the house is decorated and cozy and we've been enjoying the Christmas spirit for several weeks now. 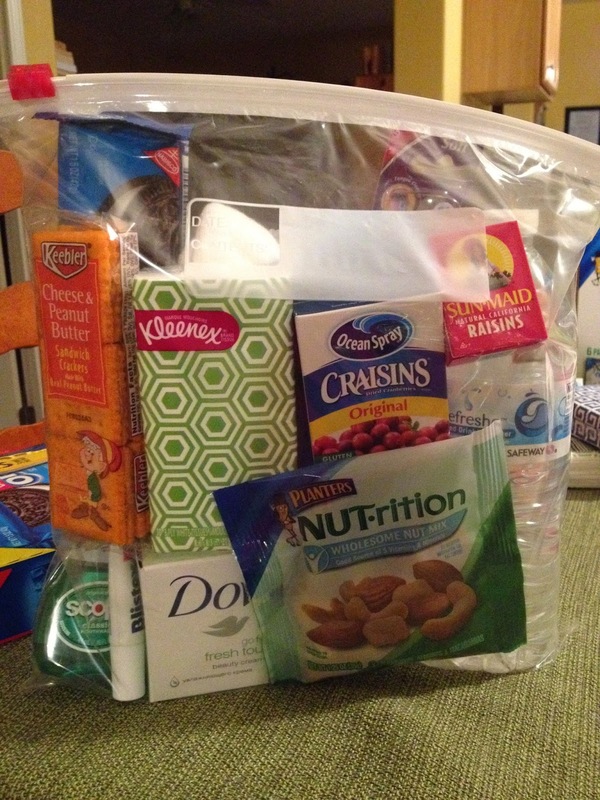 There is an idea floating around on Pinterest and various blogs about Blessing Bags. I'm always looking for opportunities to get the kids involved in service, especially during the holidays, so I thought we'd try this out. 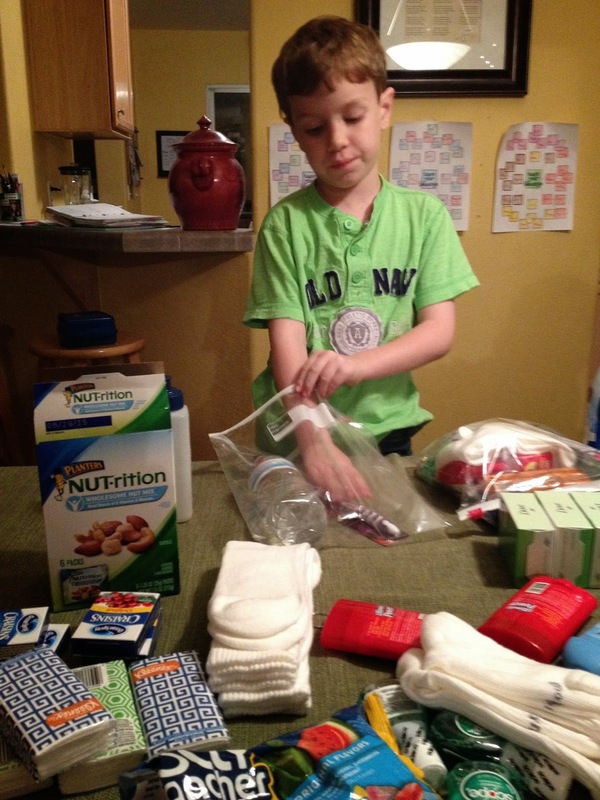 The idea is basically to assemble bags of simple items that people in need can use. Simple toiletries, some food items, warm socks, etc. We have homeless people all over near where we live and it's very common to come off a freeway to see someone sitting at the off-ramp holding a sign asking for help. I rarely have cash with me, but I always want to help. I've given food that I've had in the car, but thought this might be a nice thing to keep stocked in the van for such occasions. 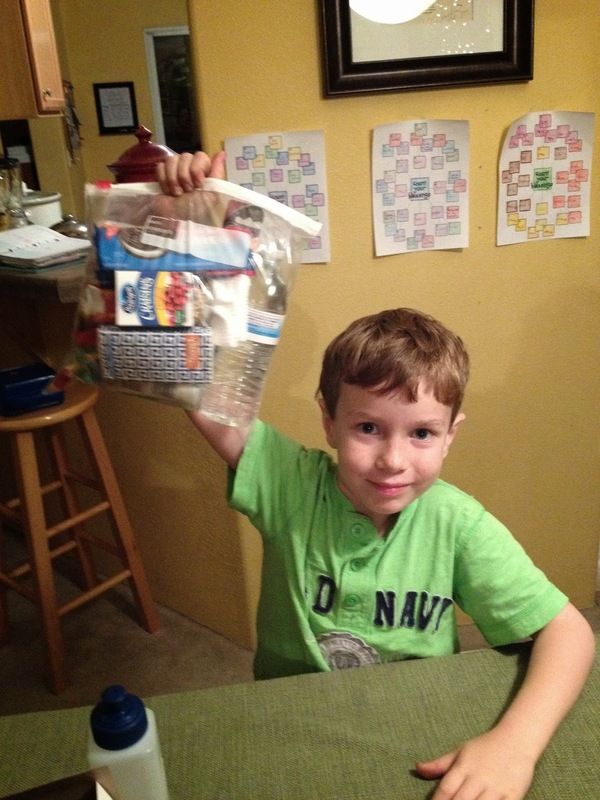 For Family Home Evening I took the boys to the grocery store and the dollar store and we collected various items to make our bags. We made "girl" bags and "boy" bags. There isn't a huge difference between the two, honestly, besides the socks, kind of deodorant, and color of toothbrush. There are lots of lists of ideas of what to put in the bags. The boys and I assembled the bags when we got home. There are many other possible ideas! We made a bunch of them and put them in a box which we now keep in our van. We can't wait for the opportunity to share them and offer the blessing to someone in need! Love this idea...have seen it and wanted to do it, but have not yet. Way to go! You should do a follow-up post on how they are received.